This treatise claims we are in the midst of another deep economic, social and political crisis. 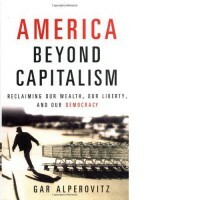 Capitalism, democracy, equality and liberty have disappeared from the United States. Corporations and rich people control the wealth and government; their power destroys liberty and the entrepreneurial freedom necessary for capitalism. Traditional reforms are inadequate. Progressive taxation and social programs only redistribute income; we need to redistribute wealth. Easier voter registration and campaign finances miss the point; federal power must be reallocated to regional governments and local citizens’ associations whose scale makes participatory democracy possible. We need shorter work weeks, stronger labor unions, worker-owned or directed firms, less debt and more respect for the environment. The book’s strength lies in its integration of diverse populist issues into a coherent agenda rooted in deep American values from the Declaration of Independence.